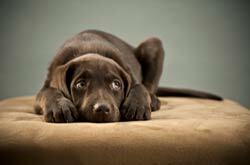 The very first signs of hip dysplasia in dogs can be noticed in a number of ways. Maybe you’ve taken your puppy or young dog home, and on its first visit to the veterinarian, the perceptive doctor notices that its hips don’t feel quite normal. Or perhaps you noticed that it has an odd way of running or jumping, and you bring it to the attention of the veterinarian. Your vet recommends that your dog have x-rays done and after looking at the x-rays, he/she informs you that your dog has hip dysplasia. What does that mean? Dysplasia simply means ‘not properly formed’. Therefore, your dog’s hip joint was not properly formed. Water is the elixir of life and it is essential to all living things. Our pets need to have access to water at all times and their water bowls should be filled with fresh water every single day. 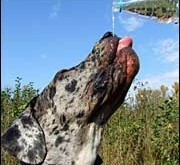 When our pets don’t get enough water dehydration can occur. Sometimes though, our pets drink too much water and although we know that water is good for our pets, too much is too much. Serious health problems can occur when our pets drink too much water. Sometimes the reason they drink so much stems from psychological or behavioural problems; other times the reason is medical. Either way, drinking too much water is dangerous for pets. When a pet drinks too much water, its urinary system is also affected. What goes in must come out so thirst and urination are naturally linked. Limber Tail Syndrome (AKA cold tail, dead tail, broken wag) is quite common among some breeds of hunting dogs, such as Labradors, Golden Retrievers, Pointers, Setters, and Beagles. It is a condition in which the tail becomes limp and sometimes painful after exertion, particularly during inclement weather, swimming, or in an under-conditioned dog. 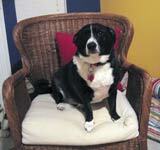 It is a condition well-known to hunting dog owners and trainers, but not commonly seen by veterinarians. 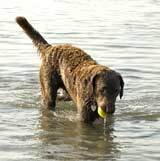 The syndrome is characterized by the swelling of the muscles at the base of the tail (the wagging muscles, which are also used heavily during swimming when the tail may serve as a rudder). These muscles are bound to the tail by a tight ring of connective tissue. As the muscles swell and expand, the connective tissue begins to serve as a tourniquet – cutting off normal blood flow. When increased pressure within a confined space results in reduced blood flow, it is known as a ‘compartment syndrome’. Any owner of a dog who has had “cherry eye” will tell you that it is not a pretty sight. Perhaps you have witnessed it yourself and have seen the large red mass bulging out of the inner corner of a dog’s eye, from which the name ‘cherry eye’ originated. While not the most visually appealing condition (for the owners or the afflicted dog), cherry eye is actually a fairly common and benign occurrence in many breeds of dogs. Though it may appear somewhat like a tumour or even an awfully big bug bite, the ‘cherry’ on your dog’s eye is actually a prolapsed (or popped out) gland. Known by veterinarians as the nictitans gland, this gland is present in the third eyelid of dogs and aids in the production of tears. Unlike humans, many animals possess this third eyelid which closes horizontally across the eye to provide extra protection and moisture. Cats and dogs have plenty of fur and the battle of the fur and the household never seems to end. Cats and dogs don’t seem to care much about losing a bit of fur but it does bother many humans. Given that the fur problem for humans is not likely to end anytime soon is there anything we can do to reduce the amount of fur that cats and dogs shed? The answer is ‘yes and no’ and has a lot to do with the personality of the human not the cat or dog. Dogs and cats shed and that is a fact of life. They can no more stop shedding than we humans can stop shedding. (Humans shed skin cells and lose body/head hair every single day). Catnip is a plant with pretty coloured flowers at the tip and heart shaped leaves on a thick stem and contains a chemical ingredient that often has a stimulating effect on cats. In this article, we will discuss the possible effects it can have on your cat, and common questions you may have regarding catnip. Catnip contains chemicals that trigger a behavioural response in cats when they breathe it in. What is this behavioural response? Well, let’s use an example that I’m sure we’ve all been exposed to. The smell of delicious freshly baked cookies comes wafting to your nostrils, this triggers you to salivate, so you to walk to the kitchen and cannot help eating the cookies. Dark skies and rumbling thunder is often a stressful time for many dog owners. In all likelihood, it is even more stressful for the dogs themselves! Fears and phobias in our companion animals are more common than one might imagine, ranging from fear of loud noises and new places to the fear of people and other animals. There are many different components and reasons for a fear response in an animal. It can be an innate response, meaning that it is genetically programmed into the animal’s behaviour, such as fear for a predator. If there is a lack of proper socialization to different people and environments when the animal is young, it may be fearful of unfamiliar situations when it is older. 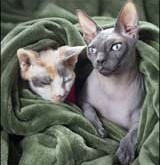 For many, just the thought of a hairless cat is enough to make them shudder. For these people, the sight of a hairless cat is shocking, and touching one is downright scary. If you are one of these people, then this article is unlikely to sway you in the other direction. However, if you are the kind of person who has always been a little bit intrigued by the unique look of hairless cats, read on. Behind their striking appearance is a fascinating background, and if you are considering making a hairless cat part of your family, there is also a plethora of information to know about the proper way to care for these beautiful creatures. Congenital hairlessness in cats is an extremely rare trait. Essentially, a hairless cat is the result of genetic mutations in one or more of the genes which encode for normal hair development. While the word ‘mutation’ implies that this genetic condition is unwanted and accidental, there are actually many breeders who select specifically for the hairlessness trait and work to maintain the hairless lineage in their cats. Can my cat get depressed?